Posted by Swami Sadasivananda on his blog and reproduced here with his permission. 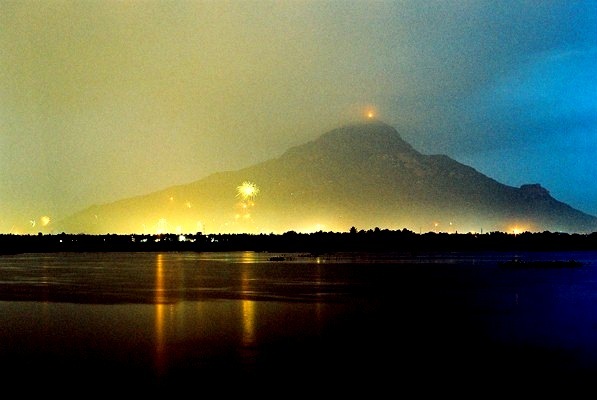 Prior to lighting the fire on Arunachala (said to be the heart of the universe), the arduous effort of ascending the sacred hill with all of the implements required was needful. This fact is symbolic of the effort required by us to light a fire within the heart. The Sanskrit word “sadhana”, coming from the root “sadhan – implements or tools”, actually means the way we use the tools that the masters and the scriptures have shown us by example. Without the needful preparation (sadhana), no fire will appear. HOW DOES ONE LIGHT A FIRE WITHIN THE HEART? Such a question of, “How to light a fire within the heart?” will only arise to one who is seeking spiritual growth. But a common error also simultaneously arises. In essence, this error is a trick of the ego, whose very life depends on being as far away from the heart as possible. So the ego says to us, “Go my dearest, visit the playground of the heart, I will help you, for I know a short-cut.” This short cut is in truth a bypass, right around the mind. We cannot even collect the firewood; much less light a fire in a place where we have not yet found the path. We need to make the mind a guiding light, which will illumine our vision and our way towards the heart. But there are obstacles. The teachings of the scriptures and of realized souls tell us that meditation, daily meditation, without interruption is the way. 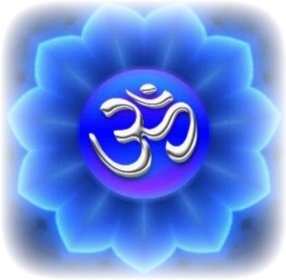 Through meditation an awareness and recognition of the intoxicating addiction to heedlessness is brought to light together with a resolve to strive for true spiritual growth. Thus the all-knowing God begins by infusing into us the will to change and seek a pure life. Though we might believe that only a simple start has been made, the shaking free of slothful heedlessness is declared by God to be half the battle. We have recognized that there is a fog that clouds our vision, and obstacles (restlessness and slothfulness), that literally obscure the manifestation of the light of the Self in abode of our true consciousness; within our spiritual heart! Regardless of whatever label we choose to call this effort, whether it be deemed purification, removal of defilement, awakening, being in oneness or even becoming still, it should be known that Bhagavan said it is “effort that instills purity” and stressed that without it the goal of lighting a fire within the heart will not be reached. Prior to lighting a fire in the heart, we must light a fire within the mind to burn down sloth, anger, and ultimately all fear. This being done, we will have the doors of the heart flung open to reveal that God has already created a bonfire, the flames of which will be our love of Him. Curing, healing, lifting pilgrim’s spirit up. With Love’s ointment: oh, perfect Paraclete! The stallion settles and he reins with ease. Above dark turmoil of dormant worlds below. Sun burst of splendour, ends soul’s dark night. To joust with Death, a fierce Titanic tilt. To end all dark sorrow, fear and guilt. Of Death’s slayer; such a sacred blessed feat. Delivering the coup de grace, vile ego’s laid! Slays his wayward mind of Self alienation. Zinging to the bull’s eye of Truth at centre. Glowing within his inner cave of heart. Holy war, waged ‘til soul and body part. A jar of truth for pilgrim’s thirst to slake. Alone, and free from lust for selfish boon. 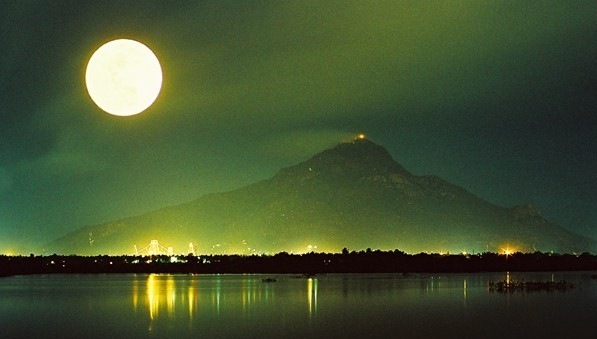 To glow beneath the golden harvest Moon. 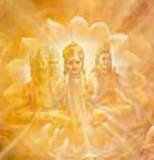 Who sit surrendered at his lotus feet. That halt the climb to Self’s most blissful place. His own Self ablaze, in a sea of grace. His friends are unconditional faith and trust. Freeing him from greed, ego, anger, lust. He finds, hidden deep at heart, Eternal Soul! In Talks, Sri Ramana Maharshi is being questioned concerning how to remove the obstacles (dross) within meditation. M.: Yes, Grace is both the beginning and the end. Introversion (meditation) is due to Grace: Perseverance is Grace; and Realization is Grace. 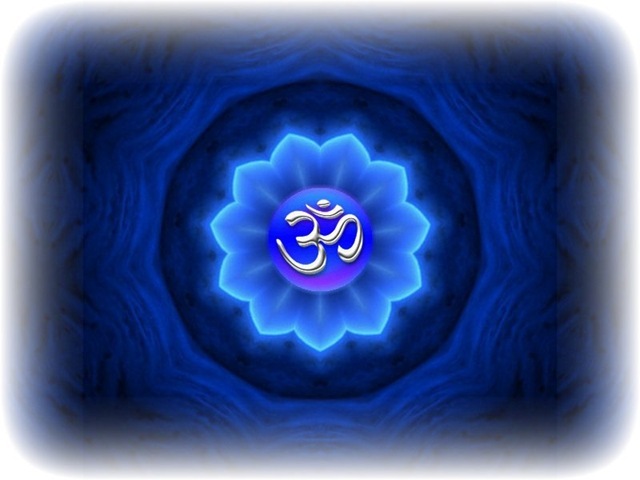 “Significance of Om, unrivalled — unsurpassed! D.: Was Visvamitra a rishi? M.: When contaminated [dross produced by excessive worldly attachment, ed. addition] he was not a rishi. D.: Can he become a rishi even afterwards? M.: Yes. By proper bhakti he could become a good rishi. Repentance and prayer will set him right. D.: With all your penance for so many years what have you got? M.: I have got what need be got. I see what need be seen. D.: Can all see the same? M.: I see only just what all do. It is immanent in all. D.: Is this the way for seeing It? M.: Method may be anything. From whatever directions the pilgrims may foregather, they must enter the Kaaba only by one route (passage) or all gather only to enter the Kaaba. D.: Please tell me two upadesas on the way to salvation as known by you. M.: What upadesa do I know? Everything is upadesa. Worship of God is the only upadesa. 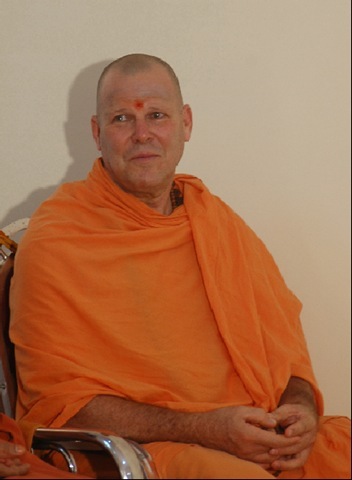 Swamiji was born in Florida in 1950. He studied comparative religion at a University in Colorado. He visited Sri Ramanashramam in 1971. From that Darshan of Arunachala he determined to take Sanyas.In 1974 he received initiation in the disciple lineage of Puri Sankaracharya. 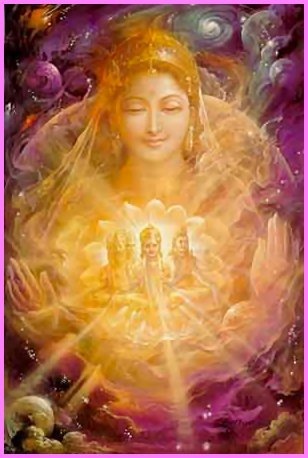 He visited Anandamayi Ma’s Ashram while she was still alive and received the golden touch of this Joy-Permeated Mother, and remained under her guidance until her passing. He was there for thirty years giving service and practicing sadhana. Since then he has been living in Tiruvannamalai and is a frequent visitor to Ramanasramam where he is available, and gives advice to questioners. He has made a thorough study of Bhagavan’s teachings as well as those of Sri Ramakrishna. Swami has also completed a new book regarding Bhagavan’s teachings on “Practical Sadhana” that isto be published by Sri Ramanashramam this spring. This book, as well as a great deal of additional works by direct disciples of Bhagavan including various other aspects of spiritual instructions are posted on a website that is maintained by the Swami.